LOW-C is on hold for the summer. See you in the Fall! To that end we offer a Liturgy of the Word for Children at the 10:30am Mass at St. Charles on Sundays throughout the year. Families can sit together as usual in church - no need to drop them off anywhere before Mass - and after the opening prayer children ages four and up are called forward. Father then dismisses them as they process to the church basement to participate in the same Liturgy of the Word that is being celebrated in the general assembly upstairs, but on their level. The readings are simplified for them and there may be a hands-on craft or coloring involved with the homily/reflection, but all the liturgical elements are there. Our hope is to introduce children to the Liturgy of the Word in a way that allows them to more fully engage with it while preparing them for introduction into the general assembly. This is not a babysitting exercise, but if an unintended result is that parents are allowed a respite from the distraction that frequently accompanies small children during Mass, then we’ll take it. Following the Liturgy of the Word and during the Offering, children are returned to their families to participate in the Eucharistic Liturgy and the rest of the Mass together. Our hope is that this model will allow parishioners of all ages to fully participate in the Mass while still allowing families to attend Mass together. If you’re interested in being a part of our Children’s Liturgy Team, please get a hold of Greg Gilbertson at (715) 723-4088, ext 102 or at stcharlesgreg102@gmail.com. 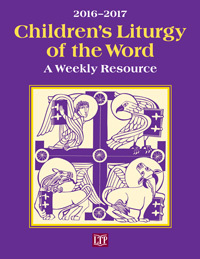 The resource we use for the Liturgy of the Word for Children (or LOW-C) is published by Liturgy Training Publications. You can see more of it here.